The classic Callas - Karajan Butterfly: now sounds even better! The 1955 Callas/Karajan EMI recording of Madama Butterfly is rightly regarded as one of the all-time classics. As the legendary Alan Blyth pointed out in his 1976 review of an LP reissue, it finds Callas at their "absolute peak of her vocal form" with taut, through-conceived support from Karajan "at every turn of the drama". However, Blyth also noted a number of technical short-comings: "recorded sound that is less than lustrous", a "confined" acoustic, "the occasional sound of studio movement" and "some momentary signs of overloading".To these I would add inconsistent tape speeds leading to drifting pitch, background rumble interspersed with accelerating traffic, and a general sense of a thin veil hanging over the sound. All of these are as present in the most recent 24-bit Callas box set transfers as they were in 1976, or in 1955 - and each has been addressed for this new Pristine XR release. The enclosed acoustic has opened out beautifully here, with a clarity and openness that brings new life to the recording. Ambient Stereo, coupled with the lightest touch of convolution reverberation, which models the real acoustic of one of the world's foremost opera houses, adds a final sprinkle of magic to a sound that might now indeed be called "lustrous". Never has this classic Butterfly ever sounded as good! Note: It is interesting to read these two reviews back-to-back. The initial response to this Butterfly was hardly overwhelming - but two decades later it was regarded as one of the highlights of the recorded canon. We have by now become accustomed to the idea that Maria Callas can sing any soprano part she has a mind to, so that, though one might not consider her a natural for the part, there is no need to be surprised that she chose to sing Butterfly. There is, however, considerable matter for surprise that Nicolai Gedda should have been cast for Pinkerton. It is perfectly clear from the moment he opens his mouth that Mr. Gedda would not hurt a flea, let alone a butterfly— and above all such an exotic specimen as this. This considerably alters the dramatic balance of the opera. Those parts of the score, moreover, where full and ringing tones are needed to realise Puccini’s intentions considerably overstrain the resources of this beautiful voice: but in other parts, where tenderness and soft lyrical tone are needed, Mr. Gedda comes into his own and can look any Italian tenor in the larynx! Among such moments, which necessarily occur in the first act, since Pinkerton has to be all out nearly all the time in the last, are his conversation with Butterfly immediately after her entrance, and his comforting “Bimba non piangere”, the gentle sensuousness of “Viene la sera” and “Bimba dagli occhi ”, later on. After this it is hard going for him and he is finally defeated when Callas is in full flood at the end of the love duet. Even so, he is never reduced to shouting, but one does want a voice like Stefano’s to fill out the soaring phrases with ringing tone. Stefano is also more in character as the brash and cynical young lieutenant who takes his fun where he finds it, without thought for anyone but himself. Campora comes vocally somewhere between these two, inclining in character much more towards Gedda’s gentier inter­pretation, and, like Gedda, paying more attention to Puccini’s expression markings than Stefano does. We may, therefore, rate Gedda’s as a gallant performance with musical merits all too rarely found in operatic tenors. Inghilleri was a paternal consul in the Decca set, Gobbi an austere one in the H.M.V,—one felt his sympathy with Butterfly was very much on the surface, Boriello, in the new set, though without Gobbi’s vocal opulence, I like best of all the three. His voice is of very pleasing quality and he never misses a point: he is obviously deeply sorry for the deserted wife. Lucia Danieli seems also, to me, the best Suzuki and Renato Ercolani’s the most malicious (and salacious) Goro; but these parts were well cast in the two previous issues. I have written at some length before about Renata Tebaldi and Victoria de los Angeles in the part of Butterfly and now, having heard Maria Callas and compared her rendering with theirs my final impres­sion, which involves no great powers of perception, is that Tebaldi is throughout wholly in the skin of the part and in it gives her finest performance on disc. She alone can open out her voice to its fullest extent without loss of quality, can command a most lovely mezza-voce—the high B at the end of the lullaby in Act 3, for example— and can the most poignantly work on our emotions. The only thing in her perform­ance I regret are the stagey outbursts of laughter, of which there are three too many. Tebaldi sounds, admittedly, mature and Victoria de los Angeles is certainly more of the “little child wife” and conveys greater charm. But her beautifully sung performance, most moving where the child is concerned, never really touched me deeply. It seems incredible that she should not have been able to put more into the anguished words in the last act, “Tutto é morto per me! tutto é finito ! ah!”. The way Tebaldi and Callas enunciate that “ah” pierces the heart. Callas gives consistently the best sung performance I have heard from her. At her entrance she takes the optional top D flat and the voice develops that slow beat sometimes noticed elsewhere: but this happens on no other occasion and she can, like Tebaldi, give a cutting edge to her tone when that is dramatically called for. There are some points that Callas misses. Tebaldi’s singing of “Dolce notte! quante stelle!” brings the scented, starlit night before us, but Callas puts nothing behind it at all and she is, for a moment, as casual in “Un bel di”, at “Chi sara” etc. Such moments are, however, few and the only other one worth mentioning is when the canon is fired and she, like Los Angeles, gives no hint of what that means to her. Tebaldi alone registers, as she quits the high G sharp, the unbearable tension of that moment. Callas’s singing of “Che tua madre”, with the cry “Ait! morta” at the end, is magnificent, and so is her outburst of joy and faith after the canon is heard. It is wonderful, in contrast to these great outbursts, to hear how she whitens her tone to suggest the youth of Butterfly. The death scene is tremendous, a generous outpouring of tone equalled only by Tebaldi, and as the opera ends one is filled with the sense of having heard a great performance of the part. Erede gives the most sensitive (and sensuous) performance of the orchestral part, Gavazzeni the least sympathetic—his tempos are also sometimes too quick—but Karajan, in a wholly sympathetic rendering, brings out more of the detail of the score than I have ever heard before, in which he is aided by the clearest and most vivid of the three recordings. The Decca set has, unfortunately, a rather blurred orchestral part. The entrance of Butterfly is better engineered than in the H.M.V. set, in that she does appear to be coming nearer all the time and not suddenly. There is a regrettable crash, after Sharpless hints that Pinkerton may never return, which sounds as if all the tea-trays in Japan bad been dropped: and there are moments when the orchestral tone is rather coarse. Though both recordings were made in the Rome Opera House, the H.M.V. acoustic is slightly more spacious than the Columbia. Between sides 2 and 3 the break comes at an awkward moment, just before Butterfly runs out to get her child, and so the dramatic force of her cry “Ah! m’ha scordata” is dissipated by the ending of the side. But these are minor faults in view of the general excellence of this most interesting and in very many ways splendid issue. “E un immensa pietà” (“it’s heartbreaking”), says Sharpless near the end of Butterfly, and in the most direct sense those were my sentiments as I listened to this set. As it progresses Callas and Karajan raise what is so often a mere tear-jerker into the deep tragedy Puccini surely intended, reminding us what a masterly score this is. Indeed my well-seasoned and wary ears were quite overwhelmed by the experience. If I knew someone who doubted the validity of opera as music-drama I would sit him down to listen to the last twenty minutes of this set, text in hand, to receive an object-lesson in what it is all about. From the false happiness of “E qui, e qui!” through the stunned empty tone of “forse potrei cader morta sull’attimo” and the expansive generosity of “sotto il gran ponte del cielo” to the searing intensity of the suicide and Karajan’s heartrending last chord, the performance is quite tremendous. But there is more, much more to Callas’s interpretation, and I could quote enough examples of her penetrating vision of what Butterfly means to fill the rest of the page. Let me suggest but three: the way she suggests at “Ieri son salita tutta sola in segrcto” (Act I) all Cio-Cio-San’s absolute faith in following her destiny and forsaking her religion, the gentle simplicity of “Mio marito m’lia pro- mcsso” and, a little later in Act 2, at the end of “Che tua madre” the impending tragedy of the repeated “Mortal”. Callas made this set when she was at the absolute peak of her vocal form, and she is the mistress of every vocal change needed to express Butterfly’s changing mood, even to the white, little-girl timbre she uses in the first act, which sometimes sounds too twee; that and the sour D flat at the end of the Entrance are my only adverse criticisms of her interpretation. Karajan supports Callas at every turn of the drama with a tauter, more through-conceived direction than he brought to his recent Decca version (SET584-6, 2/75), where the slow tempi evident here seem to my ears at least to have turned to self-indulgence and rhythmic flabbi­ness, but for once my heart was not in com­parative listening. Whenever I turned away to test reactions to other sets I longed to be back chez Callas and Karajan, and blow recorded sound that is less than lustrous. Even, on this occasion, my old love Scotto and Barbirolli (HMV Angel SLS927, 9/67) could not shake my new allegiance, although Scotto comes much nearer to Callas’s very personal interpretation than does Freni, good as she is taken in isolation too. The young Gedda presents a credibly un-caddish Pinkerton, an unthinking but hardly callous lover in Act I, full of real remorse in Act 3, and always singing with fresh, easy tone and faultless phrasing but without the ‘face’ or bright attack of Pavarotti for Karajan’s Decca recording. Gedda is happier in the part’s more lyrical moments. You could hardly have a more sympathetic Sharpless than Borriello, or a more actively engaged Suzuki than Lucia Danieli. There is the occasional sound of studio movement, some momentary signs of over­loading when Callas really lets go, for the acoustic is confined and has not been much improved by the introduction of electronic stereo, and there is a poor break between Sides 2 and 3, but honestly these considerations pale before the kind of theatrical involvement we have on all sides, and the price is very com­petitive with no recommendable bargain version available. 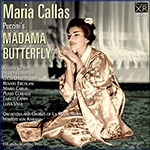 This 1953 [sic] EMI recording of Puccini's Madame Butterfly is considered to be legendary. CD notes quote Alan Blythe as saying it represents Callas "at the peak of her vocal powers," admiring that on occasion "there are a number of technical shortcomings." That is putting it mild! At the time, Callas should have been at her best, but she produces some incredibly ugly sounds, not helped by a recording that originally had some distortion. Often her pitch is suspect, and it is hard to imagine that Karajan, a stickler for perfection, might not have said to her, "Maria, do you really want to try that D flat at the end of Butterfly's entrance?" She did give it a stab, and her wobble on that treacherous note is rather pathetic. No question that dramatically she is magnificent, but for me that cannot compensate for vocal defects. The remainder of the cast is superb, as is Karajan's approach to the music, and Andrew Rose's remastering has worked wonders on this recording made well over a half century ago. However, for a beautifully sung Butterfly, there are dozens of superior recordings, particularly those featuring Mirella Freni, de los Angeles, Caballé, and Tebaldi, to mention only a few that offer vocal perfection.